Two Mead Graduates are Prestigious Rhodes Scholar Finalists - Meet the Stime Sisters! Do you have questions about your child’s English Language Arts (ELA)? This year our ELA and other content area teachers, such as social studies and science are utilizing resources to more closely align with the high standards set by the Common Core State Standards. These standards have been adopted by Washington State and are designed to add rigor and relevance to our curriculum and instruction. Click the headline to read more. 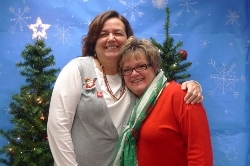 Teachers Monica Bouten and Rhonda Schalock's Breakthrough class worked feverishly to create a wonderland of games and crafts for the kindergarteners at Shiloh Hills Elementary School. Click on the headline to see pictures of their magical creation. Senior Tribute (formerly knows as Baby Ads) photo submissions are due to MHS by January 15, 2015. For specifics on these submission requirements click on the above Senior Tribute heading. 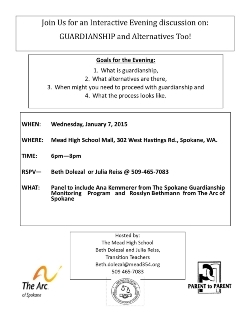 On Wednesday, January 7, 2015, we will be hosting Guardianship Night from 6-8pm in the Mall at MHS. We are thrilled that we will have Ana Kemmerer from The Spokane Guardianship Monitoring Program and Rosslyn Bethmann from The ARC of Spokane sharing their knowledge. They are the experts in our community! It's Time for Catmania and "X the TXT" Event! 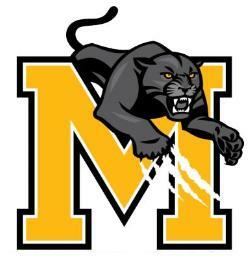 The Mead Panthers are hosting the MSHS Wildcats for the boys and girls basketball games on Friday, December 19th. The girls' game begins at 5:30 and the boys' game is immediately following. Click on the headline to see Spirit Week Attire and specifics on "X the TXT". Go Panthers! 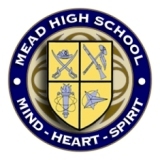 Mead will be charging admission beginning at 4:30 for all Freshman and Varsity games. 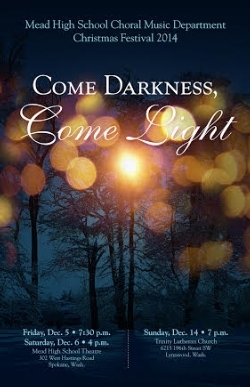 Admission is $6.00 for adults and $4.00 for students and seniors. You can also buy GSL passes for $60.00. GSL passes admit you into all regular season contests and can be purchased at the business office or at games. Please see the attached letter for more information.Thank you for your support! Congratulations to both Erin and AJ for being recognized as this fall's Students of the Quarter. 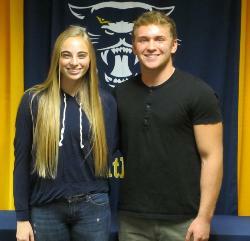 Both are seniors at Mead High School and are 4.0 students. Erin played slow pitch softball this fall for the Panthers and was a First Team All League selection in the outfield. She is currently playing basketball and this spring she will be back on the softball field leading the Panther Fastpitch team. AJ is a 3-year starter for the Panther football team and this year was a captain and an All GSL Linebacker. This fall AJ became the career leader in tackles at Mead High School and he plans on playing football in college. 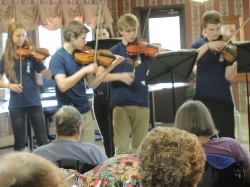 The Chamber Orchestra performed at Royal Park Care Center on Nov. 14th for a full house of appreciative residents. We performed a program of Saint Saens Danse Macabre, Dvorak Serenade for strings, Strolling Strings Watlz selections and Scott Joplin Rags. The students were well received and asked to come and perform again in the Spring.